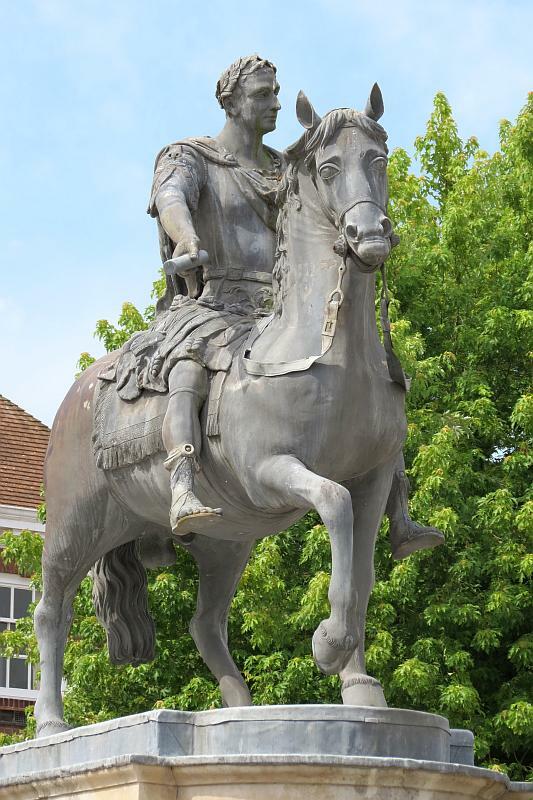 In the centre of Petersfield, a not particularly large town in Hampshire, is the town square, and in the centre of this is a lead statue of William III (William of Orange). 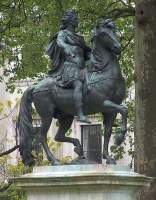 The statue is equestrian, and raised on a stone plinth with curved front and back. 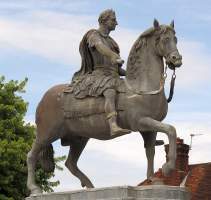 The king is garbed in Roman costume – for statues of this time and through until about the 1840s, it was considered perfectly appropriate to clothe them in classical garb – with armour, tunic, short riding robe, sword sheathed at his side, holding reins in one hand, a scroll in the other, thus as we see it today, indicating peace not war – though see below. The King is seated on a blanket rather than a saddle. His face is noble, Roman, and he wears an Imperial wreath of leaves. The face is classical, a bit craggy, the neck powerful. The horse is excellent, a wide eyed creature of the 18th century, with curved neck covered in a wavy mane like human hair, one front leg raised, as if trotting, and its tail clasped by some ringlet. The sculptural treatment is broad, less concerned with precision of detail than overall effect. It is certainly unusual to find a major work such as this in such a small place; nor even is this a 19th Century civic improvement, but as we have already noted from the style, a work of the 18th Century. The explanation is that Sir William Jolliffe, the local MP and of the most significant local family, commissioned the statue in a bequest of 1750. Apparently it stood first in front of Petersfield House, a mansion which served as the base for the Jolliffe family for some period, and some time after that was pulled down in the 1790s, was moved to the market square. A crumbling inscription on the front of the stone base of the monument is conveniently translated on a a small plaque: ‘To the most high and mighty prince William the Third who by his many and excellent services deserved well of the nation: when the state was tottering he held it firm: in good time he made safe the pure and simple worship of God; He restored and confirmed to Law its power and Parliament its dignity. One side of the base has a further inscription, recording the statue was erected in 1757, moved to its present position in 1812, bought by the Town in 1911, and restored by public subscription 1913. 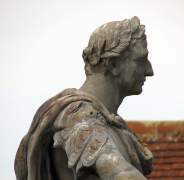 This is presumably text of 1913, and other sources say the statue was made slightly earlier, in 1753 – which is not entirely incompatible with it being put up four years later. The statue was once gilded, and there is still some colouring here and there, though this looks rust-coloured mostly, particularly on the flanks of the horse. Even with repairs from time to time, for a lead statue of this size to stand on just three slender legs is difficult, and we might muse if perhaps the legs have been reinforced inside with steel, which could be the source of the rust. As noted above, the King holds a scroll in his right hand, but it seems from local newspapers that this was a replacement for a commander’s baton in the restoration of 1913, and the scroll was again replaced most recently in 2004. 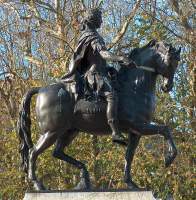 The statue has many similarities to other equestrian statues of William III, in St James Square, London (by John Bacon Junior, completing the work to the design of his father, Bacon Sr), in Bristol (a celebrated statue by Rysbrack), and in Kingston upon Hull (Peter Scheemakers). The pose of the horse, its mane and tail, the head, and for the rider, the Roman costume, the cloak fastened over the shoulder, the outstretched right arm, and so forth, are all similar between these statues. Rather than one copying from another, the reason seems simply that all were inspired the classical Roman statue of Marcus Aurelius, on the Capitoline hill. 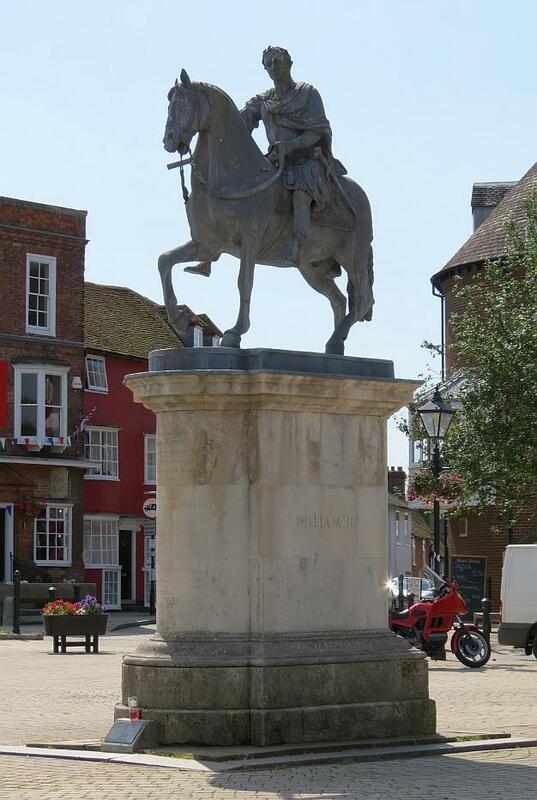 William III statue in Petersfield compared to London, Bristol . Who then was the sculptor of the Petersfield statue? Various modern sources ascribe it either to Henry Cheere, or his brother John Cheere – the two are often confused – but I have not yet come across an older reference supporting this, and though a Cheere attribution is perfectly plausible, I remain unclear of the basis of it. Regardless, a fine statue and an asset to the town. William III's portrait, as a noble Roman . On one side of the charming square is the church, St Peter of course, Norman and later, with an interesting collection of mostly modest monuments inside, described on a separate page. This page was originally part of a 'sculpture of the month' series, for Oct 2012. Although the older pages in that series have been absorbed within the site, if you would wish to follow the original monthly series, then jump to the next month (Nov 2012) or the previous month (Sept 2012). To continue, go to the bottom of each page where a paragraph like this one allows you to continue to follow the monthly links.